Start off your visit on the 9th (Fri): get to know the fascinating history of Albuquerque Old Town and then see the interesting displays at American International Rattlesnake Museum. Get ready for a full day of sightseeing on the 10th (Sat): get engrossed in the history at Indian Pueblo Cultural Center, explore and take pictures at Petroglyph National Monument, and then soar above the sights with a balloon tour. To find where to stay, traveler tips, reviews, and more tourist information, you can read our Albuquerque trip builder tool . Shreveport to Albuquerque is an approximately 8-hour flight. You can also drive. The time zone difference moving from Central Standard Time (CST) to Mountain Standard Time (MST) is minus 1 hour. Plan for slightly colder temperatures traveling from Shreveport in August, with highs in Albuquerque at 88°F and lows at 64°F. Cap off your sightseeing on the 10th (Sat) early enough to travel to Flagstaff. Visiting Bright Angel Trail and Bearizona Wildlife Park will get you outdoors. Deepen your sense of the past at sights like Bright Angel Point and Walnut Canyon National Monument. You'll find plenty of places to visit near Flagstaff: Grand Canyon National Park (Grand Canyon South Rim, Mather Point, & more). There's more to do: explore the fascinating landscape at Painted Desert. Plan my trip to Flagstaff with suggested itineraries provided by Inspirock. Fly from Albuquerque to Flagstaff in 5 hours. Alternatively, you can drive; or take a train. In August, Flagstaff is a bit cooler than Albuquerque - with highs of 77°F and lows of 50°F. Wrap up your sightseeing on the 15th (Thu) to allow time to drive to Las Vegas. Start off your visit on the 15th (Thu): examine the collection at The Mob Museum, get a taste of the local shopping with The Strip, and then admire the local landmark of Bellagio Fountains. 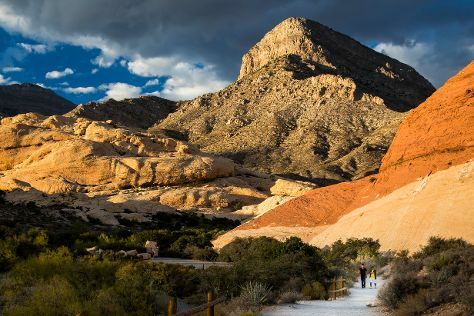 Get ready for a full day of sightseeing on the 16th (Fri): identify plant and animal life at Lake Mead National Recreation Area and then explore the stunning scenery at Red Rock Canyon National Conservation Area. To see where to stay, ratings, maps, and tourist information, read Las Vegas day trip planning tool . Traveling by car from Flagstaff to Las Vegas takes 4.5 hours. Alternatively, you can fly; or do a combination of bus and flight. Traveling from Flagstaff to Las Vegas, you'll gain 1 hour due to the time zone difference. Traveling from Flagstaff in August, things will get much hotter in Las Vegas: highs are around 101°F and lows about 77°F. Wrap up your sightseeing on the 16th (Fri) to allow time to travel back home.